Citrix and Google are collaborating to bring the best, most secure way to deliver virtual apps and desktops from Google Cloud. 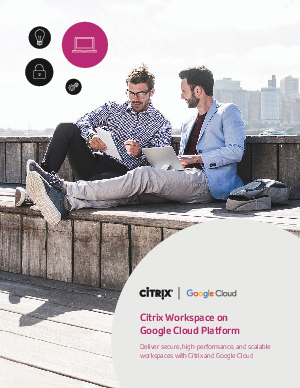 The Citrix Workspace solutions traditionally installed on data center servers—including Citrix Virtual Apps and Desktops, Citrix Networking, and Citrix Content Collaboration (formerly known as Citrix ShareFile)—are now enabled on Google Cloud Platform services. Citrix enables customers to choose the workload deployment option that best aligns with their enterprise cloud strategy and offers a variety of ways to securely deploy Citrix solutions to meet unique application needs. Whether deployed on-premises, cloud-hosted, as a Citrix Workspace service, or with a service provider—customers choose how much and which components of app workloads to manage and when and where to securely deploy business apps, data, and desktops.